Spare a little sympathy for bankers. Too soon? Fair enough, but at least the hundreds of thousands of Britons who have lost their jobs after the banking crash of 2008 may enjoy a little schadenfreude at knowing that thousands of bankers are also out of work. New figures compiled by Bloomberg show that Britain's big four banks have axed around 189,000 jobs worldwide in the aftermath of the financial crisis. And not all of the victims will have been consoled by seven-figure severance packages. 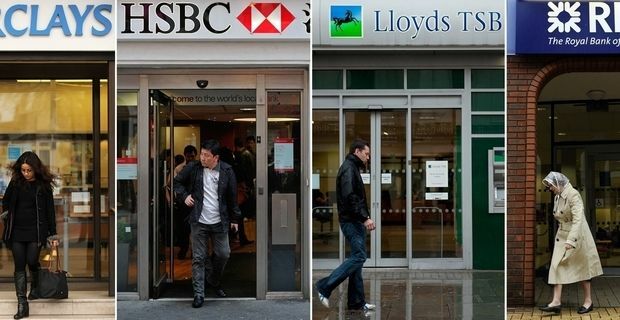 Royal Bank of Scotland, Lloyds, Barclays and HSBC have slashed their workforce by 24 percent to deal with the fallout from the catastrophe that they, and banks like them, created. The Royal Bank of Scotland, the huge banking group kept afloat by British taxpayers' money, has been one of the most enthusiastic job-cutters. They have eliminated 78,000 jobs since 2008, including 4,000 roles in its high-street sector. Further job cuts are in the pipeline, but at least employees facing the sack can take consolation in knowing that former chief executive Fred Goodwin, the man who steered RBS towards disaster, is enjoying his £16 million pension pot. Not coincidentally, since slashing the workforce, the banks are beginning to show a profit once more. Lloyds posted first quarter profits of £2bn for 2013. HSBC reported pre-tax profits of $8.4bn for the same period while RBS reported an £826m profit after a £1.4bn loss for the same period in 2012. Barclays profits are less healthy, but the bank is going through a period of adjustment after being caught rigging Libor rates. If the courts had jailed all of those executives responsible for the deception, the bank might not have had to sack so many employees. But the public has long realised that there is one law for bankers and another for the rest of us.